Ten strangers with no memory of their identities are forced to fight in a futuristic deathmatch overseen by an elite gamemaster. It is 2154, years after a great catastrophe killed nine billion people. Elite corporations now control the planet where two billion people live in slavery. Adam oversees “The Redemption Games,” a televised entertainment event where ten contestants enter Andron, a sophisticated virtual reality machine that simulates a new combat environment each season. The ten contestants have their memories erased and compete for survival in a labyrinthine maze. The victor wins freedom for him/herself and three other people. The other contestants die. The corporations use the game as a means of population control. Starving slaves watch the event through nanocameras embedded in the eyes of the contestants. Slaves may then bet on a player. If that player wins, the slave also receives freedom. If that player dies, the slave dies. Eleanor, Valerie, Julian, Alexander, Fly, Anita, Kristof, Gabriela, Luc, and Jun wake without their memories in a rundown warehouse. Occasionally, the ten contestants catch a glimpse of an unknown woman in white only for her to disappear. Kristof secretly kills Jun while hiding from another contestant. A moving door crushes Luc. Anita becomes separated from the others and is captured by armed men in masks who occasionally enter the game to keep contestants in check. Strange symbols in stone appear throughout the maze. Julian puts his hand inside one and an energy glove attaches to his arm. Julian uses the glove’s power to rescue Eleanor and Fly from a group of masked men. Contestants discover that they have each been branded with a unique tattoo on the back of their necks. Each tattoo corresponds to one of the stone symbols found in the maze. Fly thinks he recalls being a soldier at the siege of Malta in 1565. Eleanor believes the year is 2154. Julian insists that it is actually 2016. While Anita is held prisoner in a separate chamber, Adam angrily confronts her through a hologram screen. Anita remembers that she was head of the corporations’ medical division until she became part of a plot to expose the conspiracy behind the Redemption Games. Contestants remember being from different times because Andron changes its era with each new season and Anita corrupted the system’s database with a virus in her bloodstream that infected the nanocameras. Gabriela remembers that she was a cop for the network police. She had been investigating Adam for manipulating the game’s results. Gabriela finds her stone symbol and recovers two automatic rifles. However, she later chooses to blow herself up when swarmed by soldiers to create an escape distraction for the others. When the telecast is momentarily disrupted, Chancellor Gordon angrily confronts Adam over the unexpected way in which the game is playing out, and their inability to control the population if the game fails. Adam reassures the chancellor that he has everything under control. Alexander, Kristof, and Valerie rescue Anita. Anita confirms what Gabriela told them earlier and reveals the truth behind the game, including the fact that Adam discovered the plot to expose him, which is why he forced Anita, Gabriela, and Fly, who was the previous season’s winner, into the game with wiped memories. Anita also reveals that the network intentionally caused the great catastrophe. She now wishes to start a revolution against them. The seven remaining contestants regroup and do battle with another group of guards. Kristof reveals himself as a killer when he snaps Fly’s neck during the fray. Valerie recovers a rifle from her stone symbol and uses it to take down Kristof. Anita seemingly ends the game when she uses a stone symbol to open a passageway for her, Eleanor, Valerie, Alexander, and Julian to escape. Once outside, Eleanor fires an energy blast from a device in her palm that takes out Anita. Eleanor reveals that she was the woman in white’s sister and blames everyone else for killing her. She then fires a blast that knocks out Julian. Chancellor Gordon is distraught to find his servant Amber dead because she bet on the wrong contestant to win. To stay a step ahead, Adam tasks his assistant Adora with having the chancellor arrested and turning him over to network police for corrupting the game. After a chase, Eleanor fires at Alexander. Valerie rescues Alexander from Eleanor. Valerie and Alexander climb a ladder to a rooftop overlooking the congested city. Suddenly, the world begins crumbling. Valerie and Alexander realize the city was only an illusion as Adam’s voice welcomes them to the next level of the game. Back down below, Julian regains consciousness. “Andron” is a weird one, and not in a good way. Even if you never miss a moment starting from the first company logo, you might have the distinct sensation that you’re coming in late not long after opening credits conclude. It’s a feeling you’re likely to experience more than once as you ask, “did I skip a scene or something?” repeatedly throughout the movie. Take comfort in knowing that the contestants of “The Redemption Games” are just as confused. In the somewhat futuristic world depicted, ten people have their minds wiped before entering this Thunderdome fight to a Highlander finish. They don’t know it yet, but everyone is trapped in a televised deathmatch simulated by a VR machine so sophisticated, it can make a maze in 2154 look like a Hoboken warehouse abandoned since 1973. Yes, Alec Baldwin. 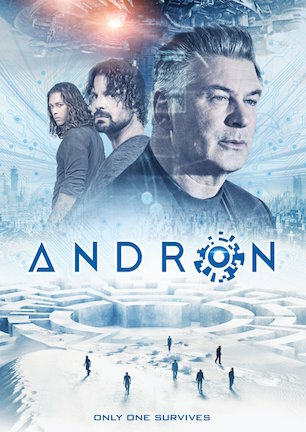 Despite being a sci-fi thriller set over a century into the future, “Andron” is not terribly interested in convincing CGI effects or state-of-the-art scenery to bring its fantasy setting to fruition. Clearly, the bulk of the budget went instead to securing Alec Baldwin’s name for the credits. Regrettably, I admit it is money well spent, as Baldwin’s inclusion hooked me into seeing the film, possibly you too, if you’re reading this after the fact. Then again, sparing $8 of his day rate for a roll of gaffer’s tape to keep Styrofoam “stones” from wiggling would have been wise, too. Baldwin is of course the main attraction in “Andron,” if only to wonder how a star of his stature ended up in a choppily-edited production of such low-budget caliber. I’d love to know the true story of how Alec Baldwin came aboard, as I’m certain it is at least more coherent than the fictional tale told in “Andron.” Baldwin’s performance is the onscreen equivalent of how some “The Simpsons” guest stars don’t even suffer the inconvenience of driving to a sound studio by recording their lines over the phone. Baldwin is somewhere entirely different than the main cast, certainly not slumming it on the dirty soundstage where everyone else is karate kicking in action shots that are too dark to see clearly. Baldwin basically acts as disembodied overseer, observing the game via hologram vidscreen and occasionally flicking his fingers with “Minority Report” movements. Only one other actor ever appears in the same room with Baldwin. Danny Glover also shares brief scenes with him, but only as a projected image spliced in via movie magic. Children’s birthday party magic, not David Copperfield stage illusions. Glover appears to be reciting his lines cold, without having rehearsed, peppering pregnant pauses in between words as though stalling while his memory catches up. Musician and model Deborah Dyer, aka Skin, makes her acting debut with a performance equally worthy of clenching teeth in vicarious discomfort. Writer/director Francesco Cinquemani has a multinational, multicultural cast on hand, but managing their disparate accents and abilities makes for acting and dialogue conveyed less than believably. Because these things demand ratings of some sort, “Andron” is awarded 1.5 stars out of five, though I don’t know what that is for, or what it is even worth. On conception, style, and execution, the movie is too much of a disjointed, hyperactive, overdramatic mess to make much sense of. “Andron” isn’t just bad, it’s bizarrely bad. June 1, 2016 by Ian Sedensky.